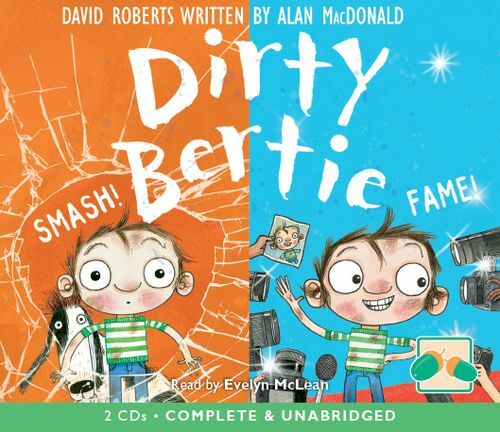 You are here: Home > Browse > Dirty Bertie: Smash! & Fame! "Dirty Bertie - the boy with nose-pickingly disgusting habits - is back for another helping of comic chaos! With ever-increasing madcap schemes and crazy capers, Bertie continues to revel in his revolting ways. Join Bertie in Smash! his 22nd adventure, as he finds himself in a spot of bother with Mrs Nicely next door, tries his hand at a round of golf and joins Gran in a winning game of Bingo. In Fame! Bertie finds fame in front of the cameras, gets into a spot of bother on a fishing trip and becomes a modern-day Robin Hood. Interest Age 7+"
Duration 1 Hrs. 38 Mins.